MOMO, an international street artist known for his work "A Tag the Width of Manhattan," presents a free lecture at Loyola University New Orleans Monday, Nov. 25 at 12:30 p.m. in room 201 of St. Mary’s Hall, located on the university’s Broadway campus. The event is part of the annual Art and Design Lecture Series. 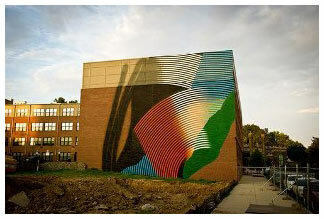 A native of San Francisco, MOMO has spent most of his life traveling and creating public art throughout the world. His artistic collaborations include Marie Lorenz, Melissa Brown, Piet Dieleman and Eltono, as well as Japanese fashion designer Yohji Yamamoto. MOMO’s published monographs include “3AM-6AM,” published in 2008, and “In 74 Pieces,” published in 2012. In December, he will participate in the international art show, Miami Art Basel, and exhibit at the May Gallery in New Orleans. Although he currently resides in New York City, MOMO maintains an art studio in New Orleans.